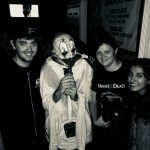 Team Elm Street Dreamers reviewed this Haunted Attraction on October 13, 2018. 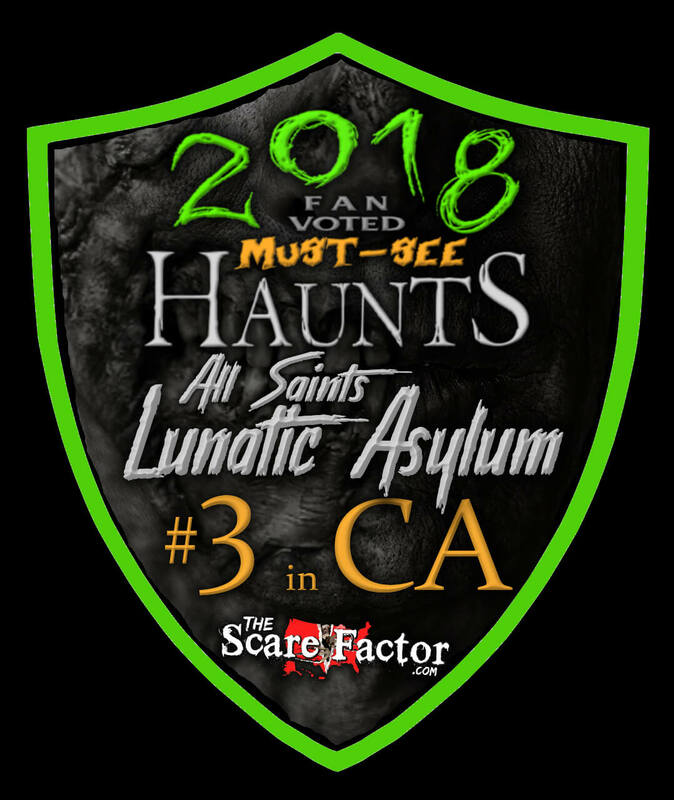 All Saints Lunatic Asylum was voted the #3 “Must-See” attraction for California in 2018 on The Scare Factor. We made the 2-hour journey from Los Angeles to Apple Valley to see what it was all about. 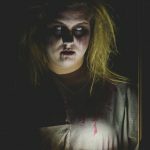 This event started as a home haunt, and now has hundreds of guests per night driving from hours away to experience what it’s like to star in your very own horror movie. 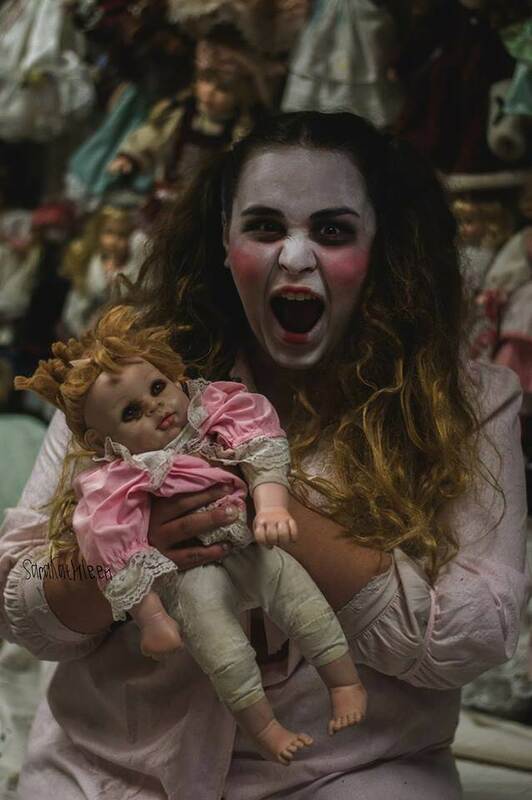 Moving floors, tight spaces, excellent actors, moments of complete darkness, and professional-grade makeup will keep you immersed in this 20-minute adventure through an insane asylum. 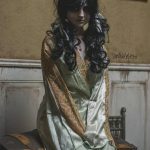 They have a great website that tells a huge backstory about the asylum, including personal files on some of the characters that you may run into within the haunt. From start to finish, we could feel the heart and soul that is put into this event. 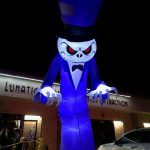 It feels so good to see a family-owned haunt with a limited budget that is capable of scaring you way more than a theme park with an unlimited budget! 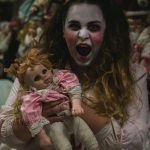 The haunt has an average of 40 – 50 scare actors per night. We felt like there were plenty of actors to help avoid any dead spaces, it feels like the perfect amount for the space they have. They have a clown named Mr. Pickles that is a roaming actor out front and in the line. He is a fantastic actor and has become somewhat of a legend at this event. People were bringing him food and lining up to take photos, while others were staying as far away from him as they could. Every actor was enthusiastic, and they do a fantastic job of staying in character. They made sure to stay with you in the current room all the way to the door, where a new actor would be waiting for you to take over, or hiding for a great jump scare. They weren’t only jump scares though; these actors have become fully developed characters whose lines and interactions will continue to creep you out long after the haunt. The victims look and sound like they are in serious trouble, and you may be their last hope. All of us were blown away with the details in the costumes. 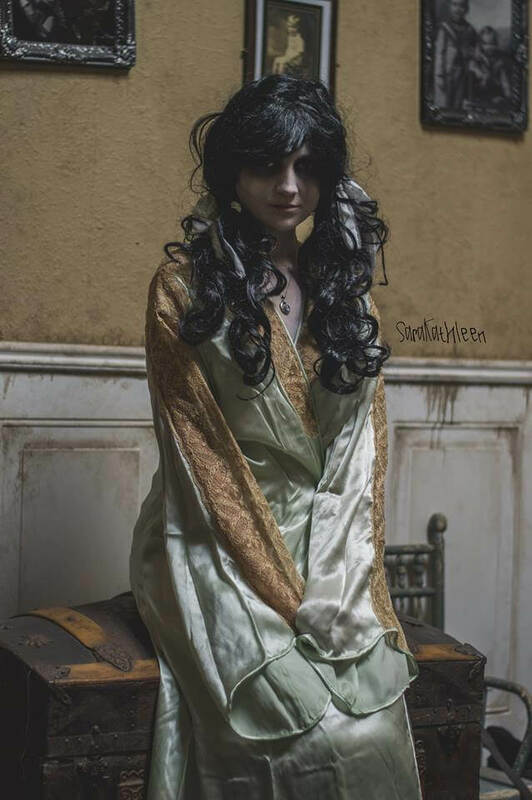 From head to toe, the actors portrayed realistic characters that definitely belong in an insane asylum. All of the costumes went perfect with the theme and looked like they were tailored specifically for this event. The makeup was 100% professional grade, and to top it off, it’s all done by family members. Even when you were inches away, every detail in the makeup looked real. So real, that sometimes it was hard to look at, but equally as hard to look away since you can’t help but admire the work that went into it! All the masks were terrifying and intimidating. They were always tucked into the costumes to avoid any distractions. On top of that, the actors had makeup underneath them to help blend in eye and mouth openings. An exceptional hybrid of makeup and masks made it hard to tell who had masks and who didn’t. This creates a realistic effect that helps keep things immersive. 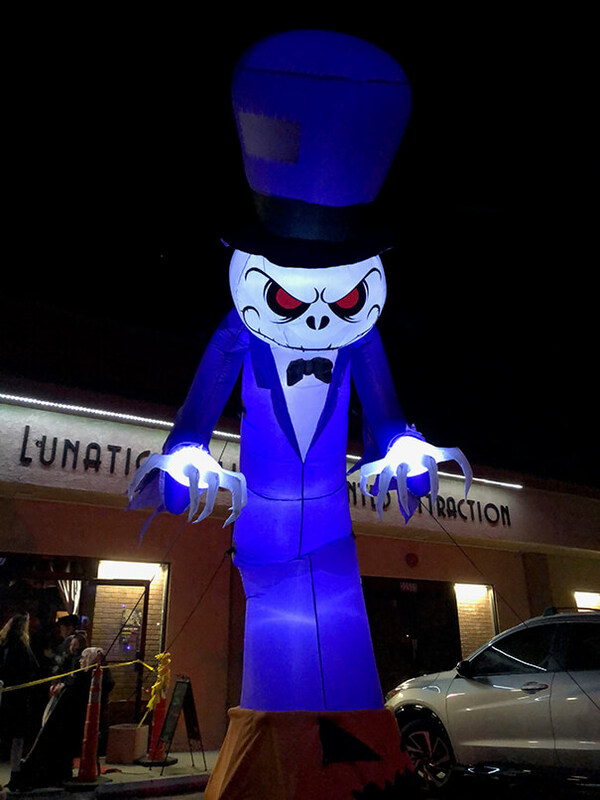 The attraction was very easy to find, they had it lit up out front with dark, eerie colors and strobe lights. There was also a large sign on the building, and scare actors roaming around out front. They have their own parking lot with plenty of room, so no issues with finding a spot. The queue line was indoors with a nice heated temperature since it was cold outside. Even with the small maze sections, pitch black areas, and shaky elevators, the event was 100% safe and you can tell they really love their fans. We saw a few emergency exits that were hidden well, but we were glad to know they were there. We were treated with kindness and respect, even before anyone knew we were reviewers. This attraction has a loyal fan base, and you can tell the staff and owners treat everyone like family. The non-scare actors were dressed in nurse’s uniforms, so it was easy to find someone to talk to if you had any questions. They also have an easy-to-use website, with all the information you could ask for like hours, tickets, FAQ, backstory, and more. Right when we arrived, there was a creepy atmosphere surrounding the haunt. This was mostly due to the scare actors roaming the outside area. All of the guests waiting in line felt excited and entertained, taking pictures with scare actors and nervously waiting for their turn. The sound effects were mostly just a soundtrack throughout the haunts. We didn’t notice any sounds that were timed to jump scares or any other high tech effects, but this didn’t take away from the scares provided. They did have one large animatronic scare that got all of us very good, that one had us running out of the room! As for the set design, every scene was detailed from the floor to the ceiling. They own this location, so they are able to work on the sets year around. The one that stuck out the most to me was the forest area. There was a thick layer of trees and the ceiling was lit with stars. This creates a beautiful moment of disbelief and feels like you are actually outside. Of course, that’s only for a moment before whatever is hiding in the woods comes out to greet you. 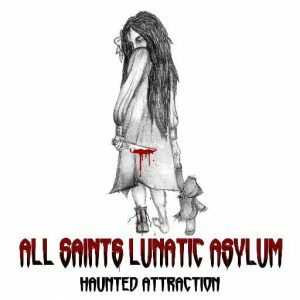 The theme for this haunt is in its name, so we already knew what to expect before arriving. Once we arrived it was even more evident that we were about to enter an insane asylum. These patients were ready for us, and we were advised that they hadn’t been given their meds in a few days. They did an exceptional job reiterating the theme, and nothing felt out of place. The location was part of a strip mall building, so, unfortunately, it didn’t represent the theme so well from the outside. But abandoned insane asylums are hard to come by, so they did the best they could do with their venue, and the inside looks amazing. 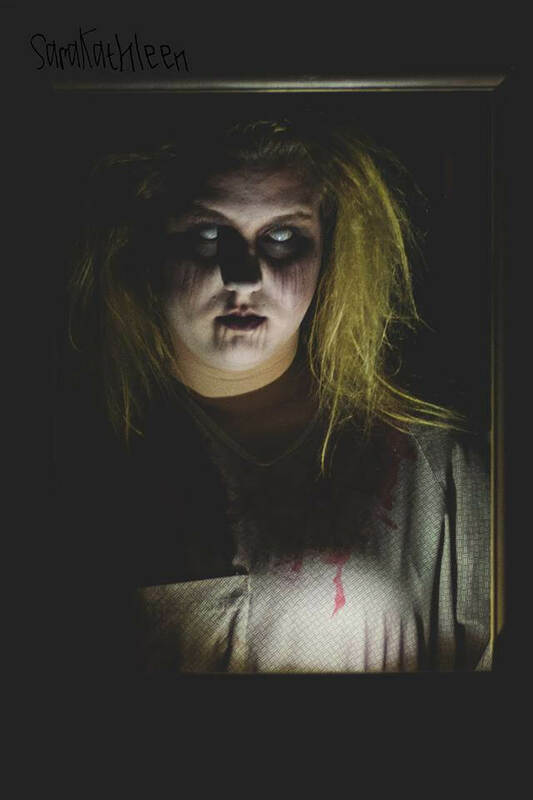 We can confidentially say this haunt had us scared from start to finish. They kept the groups small, we even saw people going in as little as 2 at a time. With the small group size and tight corners, they always waited for the perfect moment to scare the entire group. The scares were well-hidden and never predictable. Each room felt like it found a new way to keep you afraid. They kept it very dark, lighting up certain scenes they want you to see, but that’s not always the same direction the scare comes from. This form of distraction mixed with darkness worked really well and we never knew what to expect next. The finale was really great, and we were also told this was just added this year. I don’t want to give too much away, but we had to be rescued from the insane asylum. This intense ending scene extended the haunt a little longer than we expected it to be and took us by surprise. A finale we will not forget. For the quality of scares, and the 20-minute length of this haunt, the price is a steal. Tickets are $10 online, and $13 at the door. At $10 entry, you are only paying 50 cents per minute. This is one of the best deals we have ever encountered in the Southern California area! And if you are lucky enough to go opening weekend, they have a charity night fundraiser for the Special Olympics. There was no upcharges or VIP options, just a gift shop at the end with T-Shirts and other memorabilia. 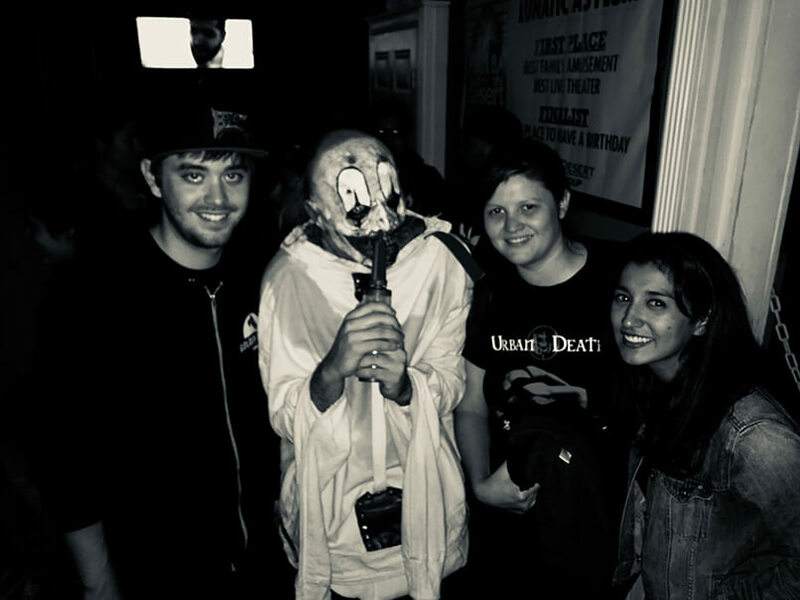 The line was about 30 minutes, but we stayed entertained with the classic black and white cartoons, the screams from attendees inside, and the wonderful scare actors roaming through the line. 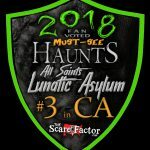 All Saints Lunatic Asylum is open through October 31 for their Halloween haunt but they will re-open for Christmas, Valentines, Easter, and Friday the 13th. Dates for those are all listed on their website. We were so excited to hear that they have events year-round, and we will definitely be back for the next one!